Every day tons of raw milk is submitted by various farmers to the co-operative societies and stored in Bulk Milk Coolers. Bulk milk coolers as name suggests they are the large containers where raw milk is stored at 4°C to maintain its quality till the milk tankers come to collect them for further processing at dairy plants. 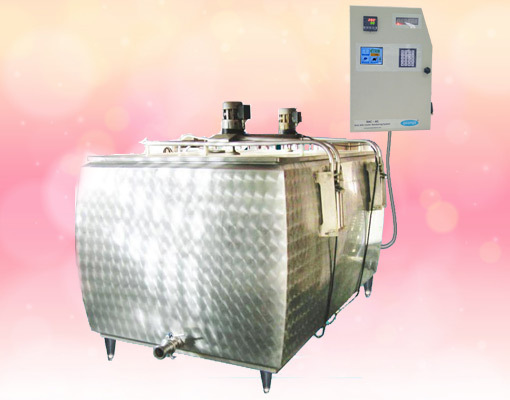 Bulk milk coolers generally come in two variants: open type and cylindrical shaped closed type. Open bulk milk coolers comes in capacity ranging from 500 litres to 3000 litres. While Cylindrical shaped closed type comes in capacity ranging from 3000 litres to 10000 litres. However, the biggest challenge which co-operative societies or private dairies face is to maintain the quality of raw milk as if neglected quality of raw milk degrade faster than pasteurised milk. Refrigeration compressors – These are used to chill and maintain desired temperature of raw milk. Agitators – They are used to mildly stir raw milk inside the bulk milk coolers to maintain uniform temperature of entire raw milk. Load cell - They are used to measure the weight or quantity stored of raw milk. Mostly used in open type bulk milk coolers. Laser device - They are mounted on the top bulk milk cooler for level measurement to measure raw milk quantity. They are used in cylindrical shape closed bulk milk coolers. Generator – They are used to supply electricity in case of power cuts. Even after this many equipment, it gets really difficult to maintain quality of raw milk. They are several reasons such as refrigeration compressor or agitators stops working, sudden power cut, failure of generator, etc. Big Question: How to maintain quality of raw milk in Bulk Milk Cooler? To maintain quality of raw milk in bulk milk coolers following steps can prove to be helpful. · Pre and Post Cleaning: Bulk milk coolers are required to be cleaned before milk collection and after pick up from milk tankers. Sanitizing should be done after proper clean up. · Equipment check & maintenance: Agitators & compressors are required to be checked and maintained on regular basis to avoid uncertainty of equipment failure. · Check for contamination: It is very important to evaluate the condition of bulk milk coolers on regular basis and check for contamination through leakages or corrosion. · Don’t open the lid if not necessary: Try to not open the lid or inlet or outlet of the bulk milk to avoid entry of unwanted foreign elements which can deter the quality of milk. · Clean surrounding: it is very important to maintain hygiene and cleanliness around the nearby area. · Temperature check: Continuously check the temperature of raw milk and make it sure that it remains between 4° C to 6° C. Temperature play very critical role in maintaining quality of milk. · Secondary source of energy: Generator or other source of electricity should be there in case of power cuts. · Don’t mix: Don’t mix left over or soured milk into the raw milk stored in the bulk milk cooler as it can degrade the quality of overall/total milk stored. However, whatever measures taken sudden failure of equipment like agitator or refrigeration compressor can’t be taken into account and always presence of member of operator or supervisor of milk collection centre is also not possible. There is always essential requirement of monitoring system which can monitor all parameters like status of agitators, compressors, quantity and temperature of milk, etc. All this is possible with our product “Tank Weighing System” developed by Prompt Softech. It can monitor all the parameters like temperature, quantity, status of agitator, electricity supply source and compressor in real time.